Just few days back Glo announced October 31 to be free data day and now they are up again with another amazing offer tagged as Glo Everyday Bonanza. 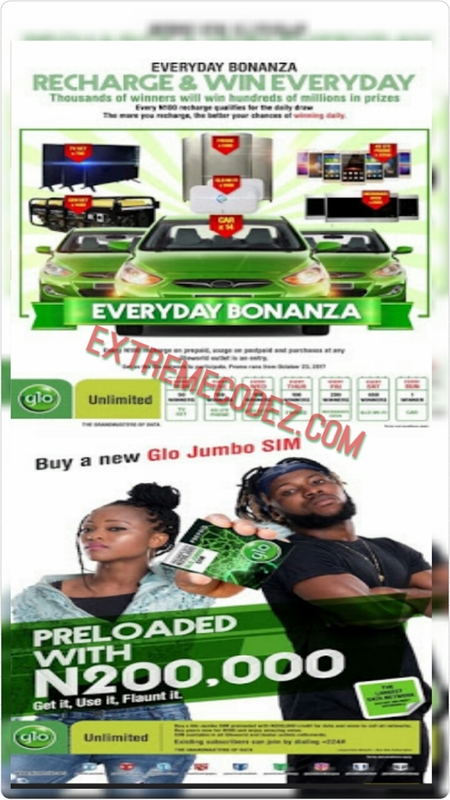 The offer is in 3 different packages Glo Everyday Bonanza, Glo Jumbo Sim, and the popular Free Data Day now you can feel the power of Glo and that's while they are being rated as the grand master. Meanwhile, the three packages that was officially announced by Glo is what we are going to be talking about how you can join any of the packages so scroll down for more details. Glo free data day appears to be a monthly exercise for the operator as the promo started a couple of months ago and now we are going to have another one come 31st of October. Don't be left out kindly click here to join the Glo free data day before it's too late. Don't forget to share this good news to your friends and family by using any of the below share buttons. Just few days back Glo announced October 31 to be free data day and now they are up again with another amazing offer tagged as Glo Everyday Bonanza. 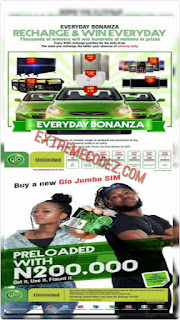 The offer is in 3 different packages Glo Everyday Bonanza, Glo Jumbo Sim, and the popular Free Data Day now you can feel the power of Glo and while the are rated as the grand master.